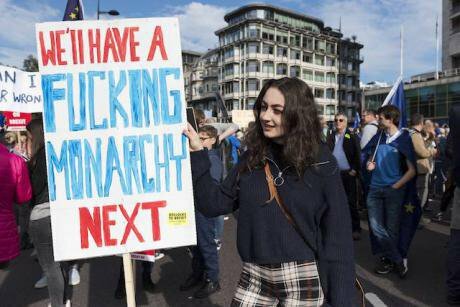 One of over half a million protesters who demanded a Final Say at the People's Vote March, London, October, 2018. Ik Aldama/ Press Association. All rights reserved. With his powerful combination of intimate knowledge of the UK, a foreigner’s overview, a passion for democracy and first-hand experience of Brussels realpolitik, Yanis Varoufakis has published a brilliant intervention in the Brexit debate. Calling on us to stop being negative and turn Brexit into a ‘Celebration of Democracy’, he proposes the country holds a three year People’s Debate that puts our own government into order before making a call on EU membership. His argument has three parts. He sees an eightfold hydra-headed challenge to the status quo in Britain: eight different national, constitutional and economic issues exposed by the referendum over EU membership that combine to form the Brexit impasse. I’ll come back to these. Their clarity, brevity and completeness make them the authoritative starting point for any assessment of what should be done about Brexit. Varoufakis points out that none of the proposed solutions on offer resolves the extraordinary situation the country finds itself in. On the contrary, each will worsen the crisis. They are familiar: the Prime Minister’s Withdrawal Agreement, to crash out with ‘no deal’, or rescinding Article 50 to stay in. What few have dared to say Varoufakis does. Namely, that the fact that there is no clear majority for any of the three in either parliament or the public is a sign of the country’s good judgment. Because none of them will in fact deal with the deeper, eight-fold test the country now faces. In their different ways each, he argues, whether delivered by parliament or People’s Vote, will only exacerbate the system breakdown under way. Put Brexit on hold, have a People’s Debate. Hence Varoufakis calls for the whole framework to be shifted. Put Brexit on hold, have a People’s Debate starting in regional assemblies, that lead to a constitutional convention out of which Parliament generates the questions that then go to a new referendum and a ‘People’s Decision’ in 2022. There are similarities with the approach Gordon Brown takes and also with the call for a Citizens' Assembly to advise on the way forward proposed by Neal Lawson. All seek to break free from the confinement of the current Brexit options. Thus the former Prime Minister calls for a people’s version of a ‘Royal Commission’ made up of a citizen’s jury, to use deliberative processes to confront the profound democratic discontent Brexit has exposed. Their shared weakness is how the course they advocate can come about. Implicitly all call on the Labour Party to adopt a much more creative approach. I’m a supporter of a People’s Vote and want Labour to support the option of remaining in the EU put to the voters. At least this is something that the Labour conference put on the agenda as an option, if only as a last resort. But I’d applaud parliament if it put the issue into the hands of a Citizens' Assembly and I’d gladly see a new referendum ask whether or not to hold a constitutional convention on how we govern ourselves before we take our decision on EU membership. Indeed, more than any other path, this would deliver on the call to ‘Take Control’ and in this important sense fulfil the ‘cry’ of the referendum vote. This would deliver on the call to ‘Take Control’ and in this important sense fulfil the ‘cry’ of the referendum vote. The question Varoufakis’s intervention highlights for supporters of a People’s Vote, is how to ensure we deliver more and better democracy if his option does not convince the Corbyn leadership. Here we, just like Varoufakis and indeed the entire country, come up against Labour’s stubborn yet underpowered effort to bypass the golden opportunity Brexit offers to take on the system as a whole. Apparently many Labour supporters share the weird belief that they can inherit power after Brexit and deploy the existing British state to deliver egalitarian social and economic policies. Varoufakis’s list shows what nonsense this. For Brexit has simultaneously brought to a head eight linked issues: the question of who rules Ireland; Scotland’s autonomy; England’s lack of representation; the rigid two-party system; the lack of real democracy; the need for a parliamentary constitution people believe in; the inequities of austerity and how this generates moral panic over immigration; and the chronic dependency of a de-industrialised, finance-dominated economy. I believe that Varoufakis is right to insist that the Brexit impasse is the expression of this concatenation of issues. It means that no government whether May’s, Corbyn’s or any other, can focus on delivering just one set of them as if the storms around the others will conveniently subside. Each demands attention at the same time and all are linked. The compelling significance of Varoufakis’s diagnosis lies in his combination of the well-formulated issues he itemises. Brexit is not about Brexit. Certainly not just about Europe. It poses matters both economic and democratic simultaneously, as it demands an answer to the kind of country we are. Hence Brexit can indeed be welcomed as a chance to tackle the UK’s acute economic challenges by replacing the vulture state responsible for them – to use Adam Ramsay’s formulation. What used to be called 'constututional reform' was seen as a centrist project beloved by anoraks. Now it is clear that urgent need for economic equality that generated the Leave vote in England's northern and midland constituences demands deep democratisation of the way we are governed. Why is it, however, that the country’s parliamentarians are unlikely to grasp what Varoufakis calls our “rare opportunity to come to terms with the country’s great challenges while re-thinking the UK’s relationship with the EU”? At the moment, none apart from Caroline Lucas, show much stomach to do so. A few have stepped forward to make passionate, far-reaching critiques of the politics of Brexit. Especially women, for example Sara Wollaston and Anna Soubry among Conservatives, Leyla Moran for the Lib Dems, and Bridget Phillipson and Lisa Nandy for Labour (and outside the Commons, Nicola Sturgeon is outstanding as Scotland's First Minister). But apart from Lucas none have yet called on the country to build on the democratic radicalism of Brexit implicit in its rejection of the old elite - something that certainly will not be delivered by Brexit itself.Varoufakis says, rightly, that any “People’s Debate must address… the British constitution." Women politicians across the spectrum are demonstrating the capacity to rise to the ooccasion. But the UK’s profoundly male-dominated political-media operators fear the loss of their British self-importance. The bogy that spooks them is the country’s national question. Varoufakis says, rightly, that any “People’s Debate must address… the British constitution, including the creation of an English parliament or multiple regional English assemblies…” and that this needs a “national convention”. But for the UK this can only be a multi-national convention and here is the rub. For what if the Scots don’t agree or the English decide they do not wish to share authority over their historic country with much smaller ones? I’ve argued, most recently in Albion’s Call, that the country has the capacity to achieve a popular, federal Britain. But a constitutional convention cannot but be a convention of the nations as well. Who knows whether the younger generation, who will rightly dominate it, might prefer the Irish example over the Westminster model. In other words, they might prefer to express their fluid cultural Britishness unrestricted by the political institutions of an all-British state and embrace independence all-round within the EU. This choice cannot be foreclosed in any process of the kind proposed by Varoufakis or indeed Gordon Brown. Brexit is terminating the epoch of parliamentary absolutism to replace it with popular sovereignty. Brexit is terminating the epoch of parliamentary absolutism to replace it with popular sovereignty. Given the dangers of the latter, a democratic constitution has to be on the way. As the outcome can only be achieved by persuasion not pre-emption, whether it will lead to a federal union or separation is an open question. The other major question is how long this will take – three years or thirty? Like Varoufakis, I think we should start now and make it three. Instead of being in fear of ‘letting go’ our political leaders and their media supporters should welcome the opportunity. Then, indeed, Brexit can be transformed into a celebration of democracy.